Foreclosure listings differ from general listings in that they require agents to take additional steps to acquire them. These steps can include working directly with lenders or government agencies, building relationships with asset management companies by completing broker price opinions (BPOs), networking with asset managers, and gaining specialized knowledge in the field. This article will walk you through these steps. When looking for foreclosure listings, it is essential to not only understand where the foreclosure listing originates, but how that originating company gives out the listing. Foreclosure listings occur because a borrower defaults on a mortgage loan with their lender, so places such as banks, other lenders, and government agencies will be the first places to explore. Applying directly with banks or other lenders has been a traditional method of acquiring foreclosure listings. And with fewer listings available than in the past, it’s more important than ever to develop a relationship with banks or other lenders. Local banks, credit unions, and other lenders may offer more opportunities than national banks. While inventory in foreclosures has decreased, it is still worth picking up the phone and exploring how they source their listing agents or if they use an asset management company. While it never hurts to search and contact local banks in your area to work with them, many national banks are no longer adding to their agent roster, or using agents directly at all. A primary example of two national banks shows this trend. Bank of America, who has used REO brokers and agents directly in the past, now outsources their work primarily to asset management companies, while Wells Fargo states they are no longer adding agents as seen below. There are two government agencies to apply with to potentially gain you access to foreclosures: the Department of Housing and Urban Development (HUD) and Fannie Mae. Both agencies require that you apply to be a listing agent in their respective systems. HUD accepts applications for those who wish to sell their REO properties. Their application and process can be found on their website, and after the application is completed, you will be given a HUD identification number so that you can advertise, show, and submit offers. Working with banks and lenders to get foreclosure listings can be a difficult and uncertain process. For example, to apply to be a listing agent for Fannie Mae REO listings, you register through their ProcureOne system, supply your basic information such as Broker/Agent licensing information, and then they will contact you to formally apply when sourcing an agent in your area. Placing your information into a system is not a guarantee of getting foreclosure listings, but does put you in the place of possibility. For example, registering with Fannie Mae simply means you’ve been put on a list and will be contacted (along with many others) to formally apply if they need an agent in your area. You may wait a long time before being contacted, and even when you apply there is no guarantee of acceptance. BPOs are an appraisal process performed by an agent where the foreclosed property is compared to three or more similar properties to determine its value, then adjusted depending on any differences. Asset management companies generally contract BPOs out and being the agent to conduct them is a great way to build a relationship with those companies. The complexity of BPOs will vary with the type ordered, as well as depend on whether the property is currently being occupied. Although exterior BPOs will not require you to enter the property to assess, interior BPO orders are to be completed even if there are occupants. Agents should be aware that to do this work can require difficult conversations, and sometimes residents who can be resentful of the process at hand. Despite the downsides of doing BPOs, many consider them a rite of passage to acquire foreclosure listings. Along with the difficult interpersonal interactions that may be had, BPOs are notorious for paying poorly (sometimes only $50) or sporadically (depending on the company), and the volume you may conduct prior to acquiring a listing might be significant. A useful way of viewing BPO work is as a paid channel to the eventual foreclosure listing. Getting your name in front of the asset managers repeatedly with high quality work is one of the best possible inroads to getting foreclosure listings. The more BPO work you do, the greater your experience, and the greater chance of getting noticed for foreclosure listings will be. While there are many strategies to get foreclosure listings, and there are no guarantees, doing BPO work is the channel used most extensively and with the best chance of success. The typical path to getting foreclosure listings now is by doing work for the asset management companies that banks and lenders outsource their work to. Asset management companies often require significant work volume from agents, in the form of doing BPOs, before they are assigned their first foreclosure listing. Connecting with these asset management companies and doing BPO work for them is one of the best ways to get your name in front of asset managers and eventually start to be assigned listings. Signing up is the best way to start getting BPO work and companies like Clear Capital have a solid reputation and clear process for signing up and beginning to work. There are literally hundreds of asset management companies you can do work for, so be sure to do your homework and check forums for their payment reputation, and the likelihood that doing significant BPO work will convert into getting foreclosure listings down the line. Networking with asset managers is one way to get foreclosure listings. Building relationships with the right people can help you get to the top of the list when foreclosure listings are assigned. People enjoy doing business with those they trust, and getting their attention requires going to the places that they are. Conferences are a way to connect with individuals and companies on a personal level that you may never get face time with otherwise. It’s an investment in your future. While some fantastic conferences exist that allow you to gain some insider knowledge, as well as be able to speak to some incredible door openers directly, the premier conference to attend is TheFiveStar Conference and Expo. TheFiveStar Conference has an incredible amount to offer any agent who wants to get into the business and get foreclosure listings. The areas of this conference beneficial for an agent who wants to get into the business are many. The conference hosts speakers that include the head of REO operations for national banks and mortgage default directors, and includes an expo hall full of asset management companies you can chat with directly. Learn about how they operate, what they look for, and make new contacts. TheFiveStar Conference is considered the most exclusive event in REO, and can help get you in the door through making personal connections. Along with the opportunities to meet professionals in the field through their expo, they also host networking events during the conference for the specific purpose of connecting residential agents and brokers to asset management firms. Bring your cards, keep a few resumes in your briefcase, and it’s worth your money to attend. Working with banks and mortgage companies will come with the expectation that you have the knowledge to put together BPOs and that you understand the many differences that come with selling and listing foreclosures versus traditional listings. Acquiring specialized knowledge can come through mentorship or further education. Mentorship is the way many realtors have learned to tackle foreclosure listings. If you are fortunate enough to work with a brokerage that handles these listings regularly, you will have ample opportunity to talk with others who are actively engaged in the many nuances that differentiate these from traditional listings. Many agents will work with brokers who have foreclosure listings as a part of their inventory, and if this is an area that interests you as a new agent, be sure to seek these brokers out. Foreclosure listings often require a lot more work than traditional listings, some require financial investment on the agent’s part (usually reimbursed), and many asset management companies will require demonstrated experience with these listings prior to assignment as well as look favorably on any specialized training. A great way to get up to speed personally before taking on these notably difficult listings would be through continuing education credits. Kaplan, an online real estate school, offers a four-hour online continuing education course specifically on foreclosures, REOs, short sales, and auctions for $49 that is tailored for your state to get you up to speed. Examining foreclosure trends can give you important information as to the opportunities and struggles you may face in getting foreclosure listings. In times of high inventory you will find opportunity is plenty, while in times of low inventory there is far more competition. We’ll show you how to use foreclosure trends to your advantage in getting foreclosure listings. 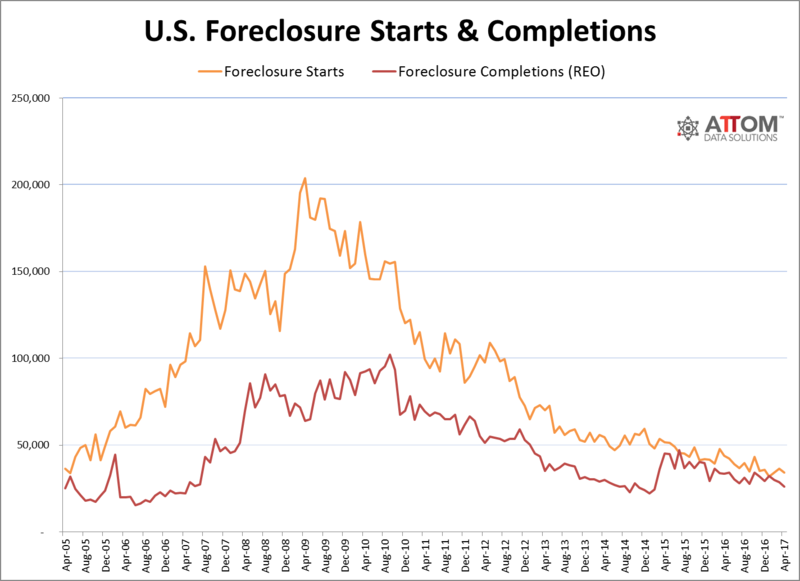 As you can see, the number of properties starting the foreclosure process and the number of those completing the foreclosure process are following a distinct trend. According to Axiom market data, that accounts for more than 90 percent of the US population, foreclosure filings are down 23 percent from a year ago and at their lowest levels since 2005. The market for foreclosure listings is tight. The information above makes the landscape clear in how to get foreclosure listings. Approaching limited inventory means high competition with existing agents, many who have likely done foreclosure listings for years and are still operating in the market. Approaching high competition requires doing high volume, high quality BPO work, and getting your name in front of the asset management companies. In times of limited inventory, working with asset management companies, and taking the extra step of networking becomes more important than ever. To get foreclosure listings as a real estate agent is a process that has no one direct path guaranteed for success. With the reduction of foreclosure inventory in recent years, new agents who wish to get foreclosure listings will have to hustle in ways that agents in the past may not have had to do, but opportunities still exist to get into the market. Competing in the current climate to get foreclosure listings can be done with demonstrating high quality work in your BPOs for asset management companies, networking, and continued education. While completing BPOs for asset management companies are working toward a future area of focus, be sure to continue building your current business income by generating leads that can sustain you comfortably in the meantime.